Australia 1: South Africa 5. No, that’s not the score from an alternative Ashes series (with an extra test thrown in for good measure). 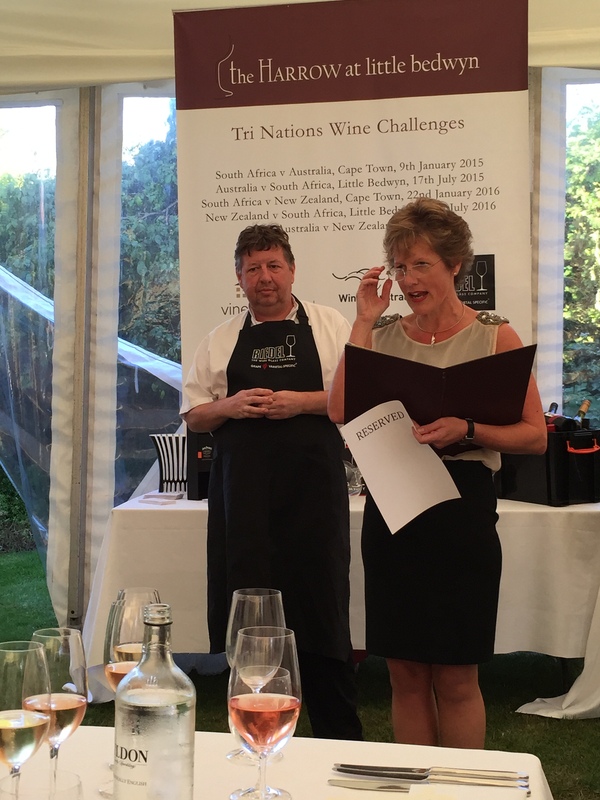 That was the score at a dinner held at the Vineyard Restaurant in Cape Town in January where South African wines were pitted blind against Australian wines and guests were asked to choose their favourite match. A bit of a wipeout for the Aussies and perhaps a result of the locals innately preferring the styles of wines they were more familiar with. So, a rematch was conceived on neutral ground. 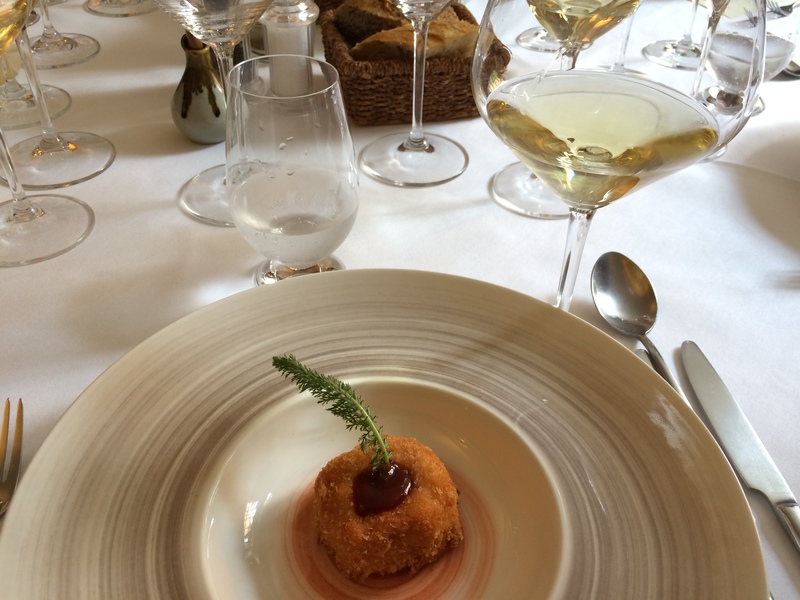 The original dinner was the brainchild of Aussie-wine loving Roger Jones, owner and chef at The Harrow at Little Bedwyn (a rather lovely Michelin starred restaurant in Wiltshire) and so where better to hold the rematch than at his restaurant. And so a couple of weeks ago a group of 60 or so attendees converged on the Harrow with taste buds at the ready, primed to sip, sniff and slurp to discern the best wine matches for each course. Who would win the second series? At this stage there was all to play for. After a crisp, refreshing glass of Welsh rosé from Ancre Hill as an aperitif it was down to the serious business of dinner and the blind tasting. Six courses lay ahead, each served with a pair of wines: one Aussie,one South African. A numbered tag on each glass meant we couldn’t lose track of the wines and for each pair we simply had to hand in the tag of the wine we preferred. Simple, right? Well, that was the idea. First up were two sparkling wines served with a pot of Torbay crab and pea mousse. The first sparkler was a rosé, pale pink in colour with delicate berry fruits. In comparison, glass number 2 was a deep gold colour with intense toasty, spicy notes – a complete contrast. This was a tough decision as wine 2 clearly had more complexity, but sadly was just too intense for the food – it overpowered the delicate, summery flavours of crab and pea. In contrast, wine number 1 whilst perhaps less impressive to taste was a perfect match for the dish. So, the first course went to wine 1 for me and also for the room. Round 1 to South Africa by 37 to 29 votes (L’Ormarins Brut Rosé 2012, Franschhoek vs Brown Brothers Patricia Sparkling 2008, King Valley). Citrus cured salmon with hummus, a quail egg and caviar salt was up next – an intense, deeply flavoured dish that at first taste suggested it might be a tough one to find a match for. 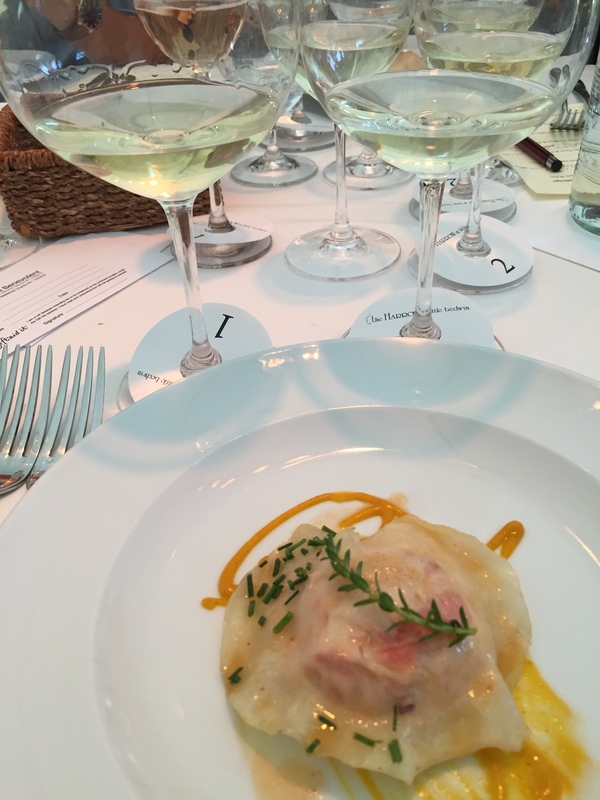 We had two Rieslings to match this course, and again two completely different styles. And this is where I began to fear a little bit for the Aussies, for on tasting wine 1 I knew just what it was: an aged Aussie Riesling. A fabulous wine, completely dry with a smoky, mineral complexity to it – quite different to wine 2 which was floral and fruity and just slightly off dry. Personally I thought the Aussie wine was a much better match: the savoury notes complementing the earthiness of the dish – but I also worried that the style might be too left-field for some whereas the SA wine was perhaps easier to drink. So no surprises when the results were announced, round 2 comfortably to South Africa by 41 to 24 (Peter Lehmann Wigan Riesling 2010, Barossa vs Hartenberg Occasional Riesling 2012, Stellenbosch). The Chardonnay course followed, to match Lobster Dumpling served with a carrot and ginger purée and chilli jam. Again, a flavoursome dish. This was probably the toughest pair to decide between – really I could have chosen either. Wine 1 showed a bit more oak influence with a buttery, nutty flavours. 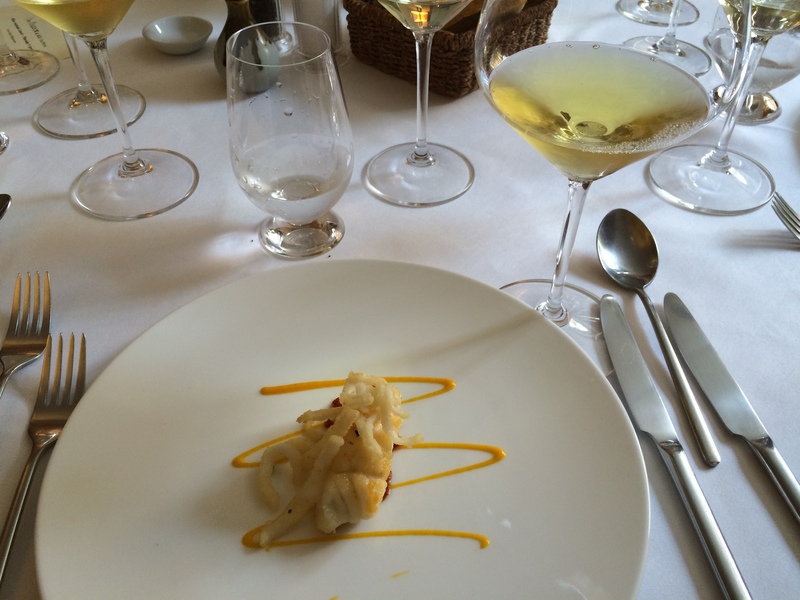 The extra body in the wine from the oak meant that it matched the texture of the dumpling really well. In contrast, wine 2 still had some oak influence, but was fresher with brighter acidity and more minerality – something that really helped it to cut through the rich food. As I said, a tough decision. After much deliberation I finally settled on wine 2, preferring the fresher style. When the scores came in it seemed that it must have been an easier choice for many: another decisive win for South Africa 43 to 23 (Waterford Estate Chardonnay 2013, Stellenbosch vs Shaw & Smith M3 Chardonnay 2013, Adelaide Hills). Onto the Pinot Noirs and surely it was time for an Aussie superstar? 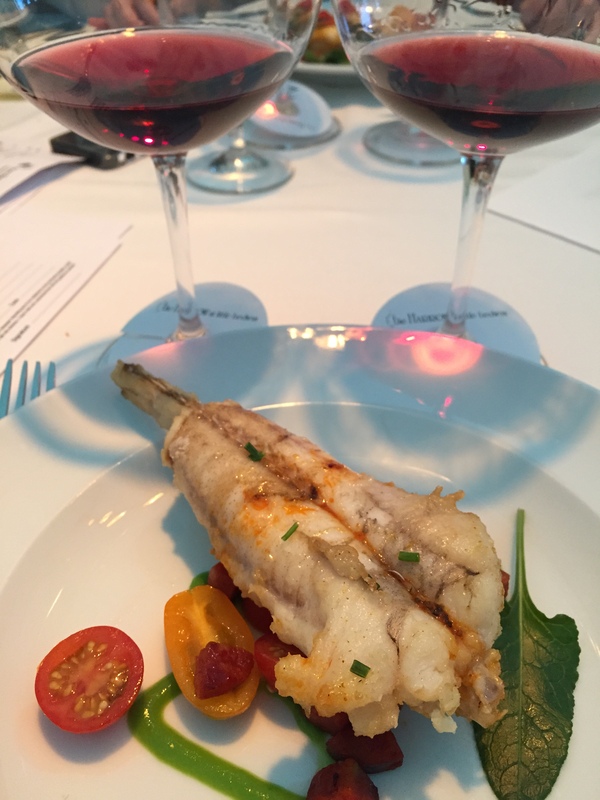 The dish was monkfish tail with chorizo, tomatoes and spinach – a great combination that should be a good match for a Pinot. Wine 1 proved to be a simple, fruity style full of red fruit flavours and a hint of star anise spice and some smoky, baked earth notes. Wine 2 was quite different – a more serious wine with real intensity and concentration. Along with red and black fruit flavours there was a lovely savoury herby flavour and bright acidity. It was a great match for the spicy chorizo. Probably the easiest choice of the night for me and the room agreed. Finally, Australia was on the board winning 40 to 26 (Hamilton Russell Pinot Noir 2014, Hemel en Aarde vs Dalrymple Single Site Pinot Noir 2012, Tasmania). 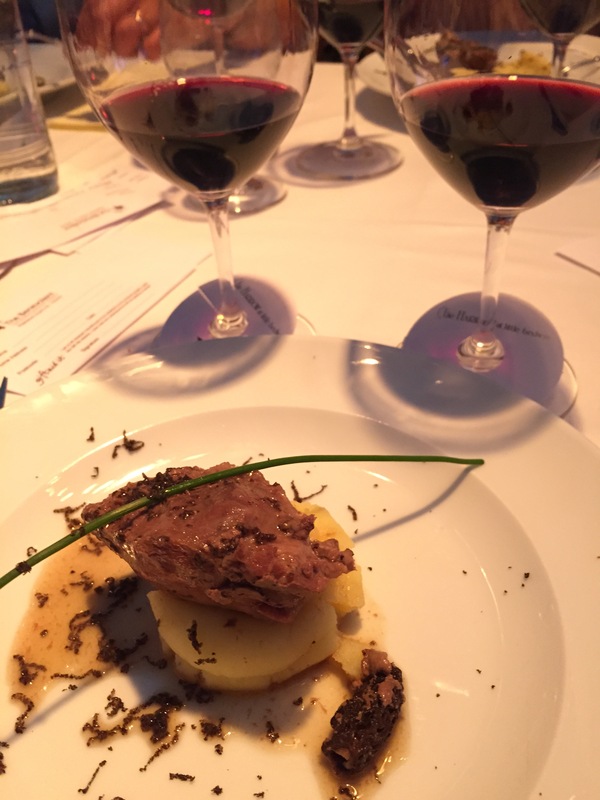 The final savoury course of braised pork cheeks with truffles, morels and mash was served with a pair of Shiraz. Wine 1 was a bit of a monster, full of sweet dark fruit, chocolate, spice and smoky notes. Dense and voluptuous – but balanced by bright acidity. In contrast wine 2 was more medium bodied with red fruit and a fresher style. However, it also had an overpowering charred flavour to it that for me dominated the wine. A shame as otherwise it would have been a clear winner. But, clearly the rest of the room disagreed and once again South Africa took the round – 40 to 25 (Penfolds Bin 150 Shiraz 2010, Barossa vs Eagles Nest Shiraz 2012, Constantia). Finally, it was the turn of the pudding wines. Could Australia take back another point? 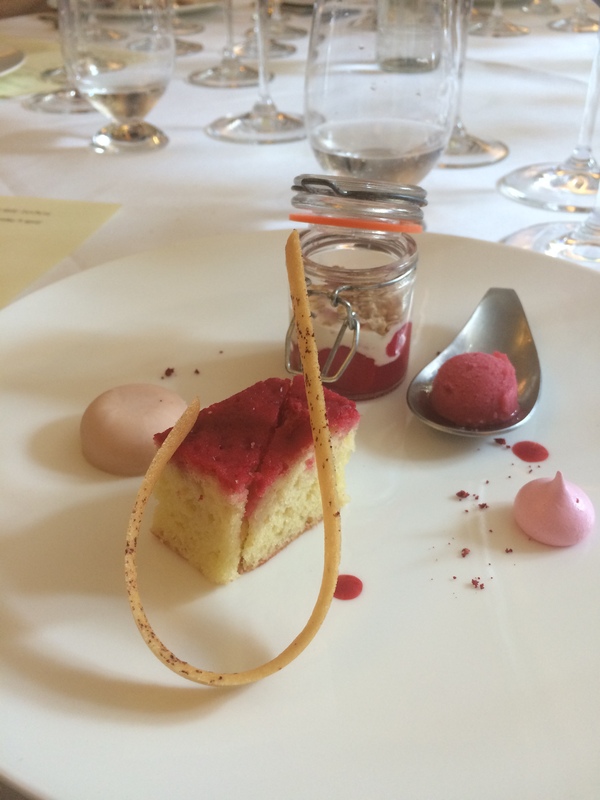 The dessert was a combination of strawberry in different guises – pannacotta, gateau, parfait, macaron – all completely delicious, but all far too delicate for the sticky sweeties. A glass of moscato would have been perfect – as it was I chose the wine then pudding option: all the better to savour the wines. And actually there wasn’t a huge amount in it: both were seriously impressive. Wine 1 was full of dried fruit, candied peel and honey along with a lifted floral note to balance. Wine 2 was perhaps a touch more savoury in flavour – dominating on the caramel, marmalade and toffee notes – but overall sweeter in style. After some serious consideration (well, both were delicious so it seemed only fair to keep tasting them) I eventually plumped for wine 1. And when the results came in it was the closest score so far: 36 to 30 with South Africa taking the final round (Klein Constantia Vin de Constance 2008 vs De Bortoli Noble One 2009). So, there you have it – once again South Africa won 5 to 1. Pretty impressive, and I have to admit a bit of a surprise. Personally I think both countries fielded some truly excellent wines and the score could have gone either way. Perhaps some of the South African wines were a touch more easy-drinking and perhaps the large table of (very vocal) South Africans swayed the score. But, that would be taking too much away from the individual wines. The scores don’t show just how much analysis, conversation and interest these pairs created among the attendees. For once the wines were the stars of the night and it was fascinating to listen to what everyone thought, how they argued for their favourites and eventually decided their choices. It wasn’t an easy task and the food definitely took the back seat while everyone discussed the wines. At the end of the day South Africa won hands down – but Australia needn’t hang its head in shame. And there’s always the next series where they will take on New Zealand…..
You might think that working in the wine trade means an endless cycle of wine tastings, lunches and dinners. Sadly the reality is rather more mundane; featuring a computer, a desk and the occasional cup of tea. Not exactly glamorous. But, I have to admit, every so often the fantasy comes to life – and these occasions are real privileges. 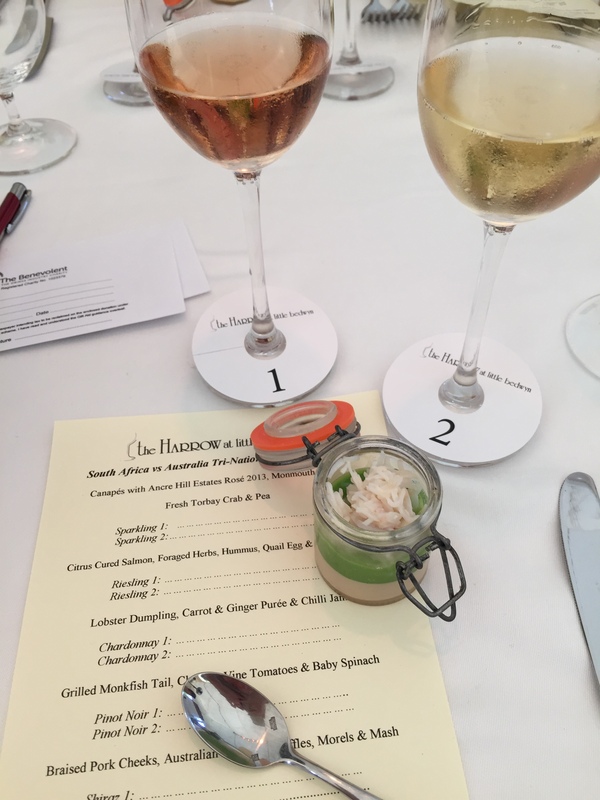 Yesterday, one such occasion took me out into rural Wiltshire to enjoy a stunning lunch matched with a selection of great Australian wines at The Harrow at Little Bedwyn. There, husband and wife team Roger and Sue Jones have created the ultimate in English country dining –laid back and relaxed, and a real haven for foodies. We started off out in the garden, soaking up the springtime sun and enjoying a glass of Charles Heidsieck NV champagne. Attention to detail is key in any restaurant – and at The Harrow that means that Roger and Sue had kept the champagne in their cellar for a number of months (“a minimum of 6… I prefer a year”) before selling it to their customers. This added bottle age had given the wine a wonderful golden hue and a great depth of toasty notes: really rather delicious and a great tip for any champagne lover. To accompany the bubbles were two different canapés. First off was a Roger classic: foie gras macaroon. The creamy disc of foie gras with a dollop of salted caramel was sandwiched between a macaroon made with cep powder – an incredible savoury taste sensation that was so different to what you might expect. The second was a little pot of crab with a watercress sauce: delicate and refreshing, and the perfect counterpoint to the richness of the previous canapé. Then we headed inside to our table to start the lunch properly. 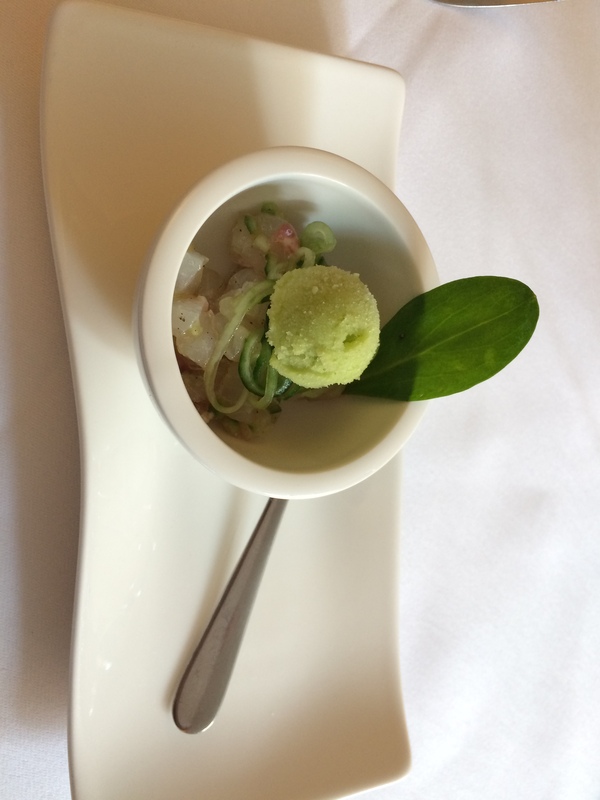 Our first wine was a Riesling from the Eden Valley: Pewsey Vale Contours Riesling 2009, served with ceviche of bream with wasabi sorbet. 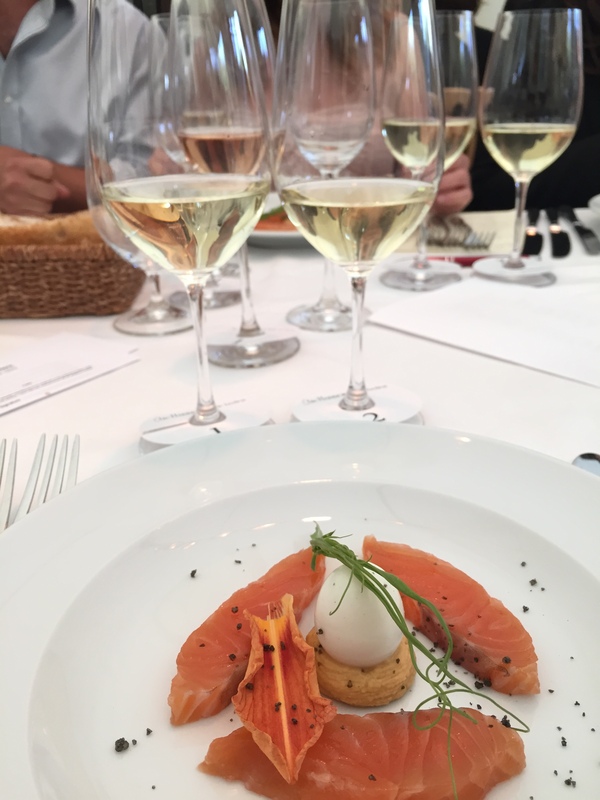 And what a great match that was: the dry, zesty Riesling complementing the delicate fish, and the toasty notes from extended bottle ageing counteracting the slight heat from the wasabi sorbet. Fresh and refreshing: the perfect starter. From there we moved onto Chardonnay – and a wine from Margaret River in Western Australia: Voyager Estate Chardonnay 2009. This was paired with a lobster doughnut complete with red curry jam. Here the richness of the Chardonnay worked both to complement the meaty lobster and offset the curry flavour from the jam. Another take home message: Chardonnay can be a great match for curry dishes, particularly those which are spiced rather than overly spicy. Our final white was much more unusual than the previous two: Aeolia Roussanne from Giaconda in Beechworth, Victoria. 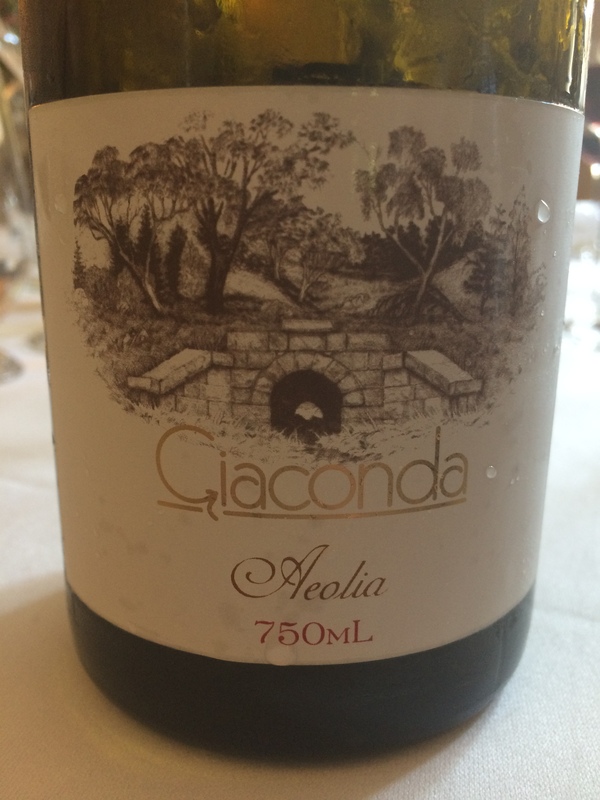 Unusual for the fact it is not a very well known variety and also because Giaconda stopped making this wine in 2012: so it is becoming an increasingly rare commodity. Roussanne as a grape variety tends to give rich, textural white wines with a notable savoury edge – and this was no exception. The pairing with a dish of cod, chorizo and squid was really something special: one of those rare occasions where the duo go beyond being a good match and instead become something altogether different. A real case of where the whole is far more than the sum of the two parts. Whilst, it has to be said, that was quite the highlight for me – there was more yet to come. 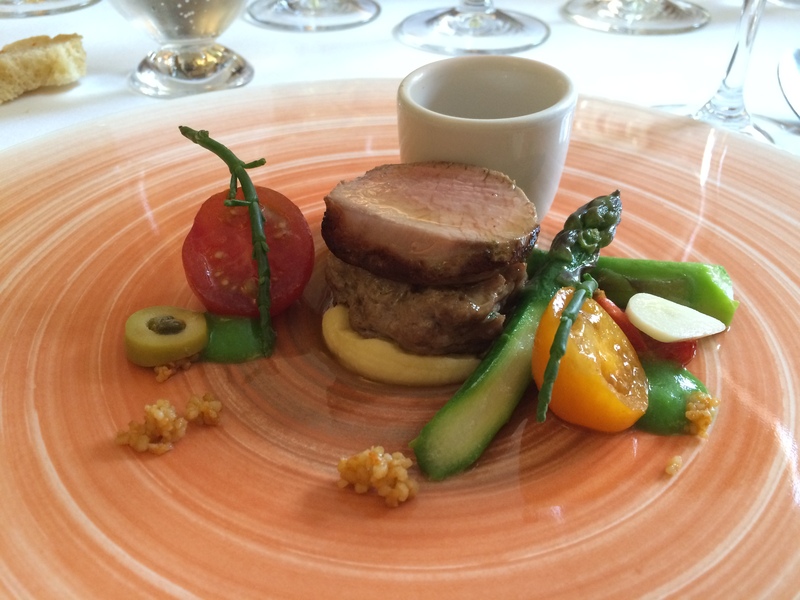 The main course of Welsh lamb, Isle of Wight tomatoes and asparagus was served with Dawson and James Pinot Noir 2010 from Tasmania. The dark, smoky Pinot worked a treat with the pink lamb and fresh vegetables: a real array of flavours on a plate and beautiful to look at too. Finally, it was time for dessert. Simply titled ‘Rhubarb’ on the menu, this turned out to be a celebration of this classic English vegetable with both rhubarb ice cream and sorbet, rhubarb sponge cake, poached rhubarb and rhubarb meringue. Delicious – and delightfully refreshing after the range of flavours we had encountered throughout the lunch. We didn’t have a sweet wine with the dish, but I would think a sweet, spritzy Moscato – perhaps the Innocent Bystander Moscato – would be a lovely addition. So, as you can see – not exactly the toughest day in the office, and I can only say a huge thank you to Roger and Sue at the Harrow for their generosity in inviting us out to their little patch of foodie heaven. If you ever find yourself out in Wiltshire (or just take the hour-and-a-bit train from London) – go and visit the Harrow. You won’t be disappointed.